There is nothing quite like live performance. Even for seasoned performers, there is still those nerves that occur before the show, the anticipation of performing lines well,the pressure of hit all your lines and marks on time, the worry that something will go wrong, but having confidence from rehearsal time. When you go out there and see the faces in the audience, it all melts away, and the story takes over. It was worth it. All of it. The hours of practice, the rehearsals, the preparation. Once you feel the audience be entertained, it is an immense rush. It’s been quite some time for me since my first stage appearance, and I find the feelings of that moment difficult to recall. I remember nerves, but mostly joy. So I am slightly jealous that A.G. Devitt was able to have his theatrical debut well into adulthood. He will remember the subtleties of waiting backstage, going through warm-ups, taking the stage, performing for the first time, and the relief after a show goes well. While all the actors performed well (and I will likely have future posts about them), for his first appearance in front of a packed house deserves some extra accolades. As the author and principal character, he’s said these lines an inordinate amount of time, but for the performance he did something that is the hallmark of all great actors – He made them sound fresh. Matthew Arnold wasn’t simply a scarred veteran of the war anymore, he displayed a subtle range that ran from sly humor, to awkward honesty, simmering romance, and, of course, murderous rage. And the speed with which he transitions is to be commended. One of the hardest moments from the live show was just after Arnold kills Max Benson. As soon as the pistol is fired, we find Elaina Dare in the doorway, having seen the whole thing. To Devitt’s credit the emotional shift from rage, to stunned confusion, to romantic honesty was a feat. He displayed range, depth, and was able to carry the beat of the story forward to its conclusion. I hope he has been bitten by the acting bug, but time will tell. LiFT began with Strike Story by Angela Harris, which is about the 1912 textile strikes in Little Falls, NY. We didn’t know it then, but this production, and how its been produced, has set the tone for how LiFT creates shows and makes decisions. In the initial read-thrus of the play, the whole cast sat in Angela’s living room, read the play aloud, and then had many discussions about characters, conflicts, language, and a host of other things, while having snacks and wine. The closest thing I can compare the openness of conversation and diverse perspectives is democracy. Everyone had a voice, and we didn’t all get along, but we somehow came together to create this show. From the start, our decisions were not made in a vacuum. As LiFT continued in other projects, I kept this open forum central to the group. As was often the case, I would choose a show, get a cast, and schedule rehearsals, but decisions about costumes, makeup, sets, even blocking were all open for discussion. If someone had an idea, we tried it. If it worked, we kept it. If it didn’t, we tried something else. It was fun, liberating, and invested the actors in the show. This worked for a few shows, but it wasn’t entirely satisfying to me. That’s when I brought the cast in on the pre-production. After selecting a script and casting the show, I’d have a read-thru at my home, feed everyone, and discuss the play. We’d then have at least two follow up meetings to lay the ground work for all sorts of matters. The result? An ensemble driven show, that everyone had investment in. Playwrights, actors, and theater makers in the age of Elizabeth did a similar thing (which I took as a model). The concept of a “director” didn’t exist. So everyone made decisions on acting, blocking, and other things collectively. Sure there would be a “point person” to establish responsibility for certain matters, but overall the ensemble, social, even democratic feel of the production is unmistakable. And has become the backbone of LiFT. After knowing some background, this next installment on blocking will focus on how, particularly in Shakespeare, there are clues to blocking in the dialogue and situations characters find themselves in. Some of what I discuss is drawn from an excellent study on this very subject, Action is Eloquence: Shakespeare’s Language of Gesture, by David Bevington. It is a clear and fascinating study on character, movements, spatial relationships, and ritual ideas ingrained in the Elizabethans. Certainly worth the read! Mark Rylance, responding to a fellow director of Shakespeare, once said, “I must come and hear one of your plays.” Not see. Tone informs attitude, and attitude informs action. Tone, Rylance knew, is what informs the entire production. I would even go as far to say that if one were blindfolded, one should be able to “see” the action of the show simply by hearing the language. So, examining Shakespeare’s dialogue is about hearing possibilities, and imagining how those possibilities communicate story and character to the audience. The Macbeths still have guests in the castle, and they find a private moment to discuss ambition and regicide in a wonderful, hushed domestic scene. Much of the language should be said quietly, maybe some through a stage whisper, but this language would feel inappropriate if shouted or said loudly. That is not to say that there aren’t outbursts where the characters catch themselves, and change tone and volume to fit their situation, but the dominant mood should be secrecy with the characters close together. Although Macbeth’s mind is already primed for murder, he insists on “going no further” and gives a few reasons for not proceeding. What must be conveyed here is that his insistence is false, or at least capable of being swayed. His tone should be insistent, but with distinct pauses at the punctuation to break up the flow of the sentence. If we scan the lines (to look for where the stresses fall in this pentameter), we gain more clues to tone. In the following line I’ll highlight the words that are stressed: “He hath honour’d me of late; and I have bought Golden opinions of all sorts of people.” Macbeth’s language isn’t confident, controlled iambic pentameter, but more of a loose string of words of someone searching for a way to convince himself. If we look at the words that receive more stress (honour’d, me, late, I, bought, gold, etc.) and those that are not stressed, we see the disparity: Macbeth truly is concerned about himself and his worth in the eyes of others, not with Duncan. Even if Macbeth’s tone is determined and insistent, his syntax betrays him. Lady Macbeth, among other things, is an excellent listener, and she listens very closely to her husband. She hears Macbeth’s language better than he does, and is able to locate this disparity and exploit it. When Macbeth finishes his speech with “Not cast aside so soon,” Lady Macbeth is canny enough to finish the line of verse. At this moment we see a subtle shift in power registered in language. From this point forward, Lady Macbeth will have the upper hand, and she will use a variety of tones to make Macbeth squirm. At what it did so freely? Once can easily hear all those “s” sounds in stage whisper, and when she has more punchy words like “hope drunk,” and “green and pale” we can almost hear her voice slipping into normal register, only to return with renewed, whispered, anger on “At what it did so freely?” Lady Macbeth’s verse, at this moment, is much more controlled and is nearly perfect pentameter. The force of her thought chugs forward, gaining momentum with each sentence, but her tone softens a bit on the sentence that begins with, “Art thou afeard.” Instead of outright anger, she tries a new tactic: irony. This false sincerity is an exaggeration, which carries through the rest of the speech, and is another way to cajole and demean Macbeth. This new tactic shows how quickly she adapts, and how she may not be getting the reaction she wants out of Macbeth. Though, when she accuses him of being a coward, she gets all the reaction she needs. Macbeth must do something on that line. Give her a look. Spin around. Shake his head. Something. How could he not? His honor and manhood are being attacked. This gives Lady Macbeth all the information she needs to manipulate her husband, which she does to stunning effect later in the scene. In this case, we see an example of how tone in one character’s speech actually affects the blocking of another character. This is done all throughout Shakespeare, oftentimes to great effect (like in Othello or Hamlet), but is easily overlooked when simply reading. By careful manipulation of volume and tone, we understand how dynamic and palpable each character is, and understanding how they say their lines, gives us an array of options for gesture and movement. For Macbeth’s tones of false confidence and insistence, several hand gestures that would indicate “no” are plausible, and movements a few steps away from Lady Macbeth also seem fitting. Also, during Lady’s speech, Macbeth could be stationary, absorbing his wife’s words. Lady Macbeth has more range at this moment. Her varying tones of sarcasm, anger, insinuation, and accusation offer a world of gestures from finger pointing to throwing hands out in impatience. Her movements, though, would to be close to Macbeth, maybe turning him to look him in the eye, maybe talking in his ears from behind. But those choices should be worked out with the actress and director, and that is where much of the creativity and liveliness of Shakespeare begins. 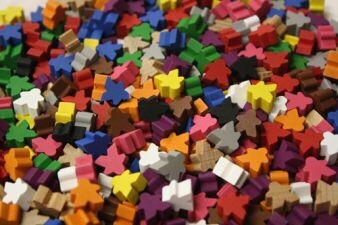 Meeples. Not actually my floor though. He wanders over to Logan to play, and ignores me. So I plunk him in the chill out chair, and ask him to apologize for being rude. He does not comply. She pauses, looks over at the meeples, then back to Declan. And just like that I’m apologizing to Declan for not getting the whole story, for over reacting, and he apologized to me too for being rude. We hugged, and departed. I can’t speak for Declan, but I felt a distinct sense of connection and closeness after that debacle. It was nice. Besides being right, combined with the events described, my wife unknowingly made a profound connection about art. Let me explain: Great art should break with held patterns, unsettle us (even confuse and anger us), should provoke dialogue, and, once explained, should offer new perspective, and give us a deeper understanding of ourselves and our relationships. I was fortunate to experience it in daily life, though the same experience can be had through engagement with art. Matisse and the Fauvists were lambasted for their paintings, as was Picasso. Ulysses by James Joyce was banned in the United States for a time because it was considered obscene. Modernist poets like Eliot, Pound, H.D., Williams, Stevens, Moore, Bishop, and others all faced backlash (some more than others, I’m looking at you Pound). Bertolt Brecht, Tennessee Williams, Oscar Wilde, Edward Albee, Paula Vogel, Eugene Ienesco, Samuel Beckett, Lynn Nottage, Ben Jonson, even Shakespeare (and this is by no means an exhaustive list), have all faced degrees controversy from their contemporaries for their work. Indeed part of the job of the artist is to find new ways to tell truth, particularly if its uncomfortable. While much ink has been wasted in the name of “experimental” whatever (because some of it is drivel), the spirit of experimentation is crucial. We need artists to recognize patterns in their mediums, as well as society, and have the wit and wherewithal to break patterns to wake audiences out of their somnambulism. Like with Declan and I, he broke with his mischievous pattern for a moment, I misunderstood it, and a third party (my wife) was able to create dialogue and jostle me out of a lazy behavior. As a result Declan and I have a better relationship. Beyond that, I can rattle off a number of plays, films, poems, novels, and books that have changed me – I think we all can. But we need it to happen more. There are so many things in our routine lives that dull our senses, that distract us from the beauty and challenge of truth. So many patterns that have become too common, tired, stereotypical, or cliche. Some of these are artistic forms (like the sonnet), some are stories (who isn’t tired of the same boy meets girl narrative? ), some are social, or economic, or religious, or a blend of all. But they need to be shaken up so we can be more present in life, to re-evaluate our life, and, hopefully, garner realizations about our life and how we live it. But more art is only half an answer. We need to make our engagement with art stronger, more enriching. We need to be open to the ideas, and really be thoughtful about what it is we are taking in. If we don’t, we have zero chance of breaking with our own patterns and letting art change us. Never would I have thought that LiFT would get involved with murder mystery theater. Not that I had a bias against it, it just never crossed my mind. I always envisioned a mix of new, original plays and Elizabethan theater for LiFT, because that’s how we started. As luck would have it, we’ve added to our repertoire. So this all started when the owners of the Overlook Mansion approached LiFT with a couple of ideas. One was for a Dia de Los Muertos event (which was a load fun, but for another post), and something like a “whole house Clue” event. Being the geek I am, I loved Clue the board game, and adored the film, but didn’t want to rehash Clue or Live Action Clue (which is actually a thing with ton of rules). We wanted something different, that people hadn’t seen before. Hence, our creation of Immersive Murder Mystery. Our idea was to create a highly interactive experience, part theater, part game, where the audience needs to engage with all the characters to get all the clues. Some audience members interacting with Ruby and Diane. What resulted was Rubbed Out at Ruby’s, an original murder mystery created by local author, Cynthia Quackenbush. She has written a number of murder mysteries, mostly the dinner theater kind, has a neat blog, and is very involved in the local theater scene. It is a fun show that keeps the audience, and actors, guessing. To be honest, it is surprisingly fun. We played for over 100 people at the Overlook, and then we were contacted to perform at a party hosted by the Jay Groah Group. And Rubbed Out at Ruby’s hits all of them. We have the good fortune of being able to travel and take our shows places. Whether it is woodsy Caroga, or the more urban Utica, we bring theater to people. Obviously Ruby’s did this, twice. We’ve opened minds to a new possibilities. 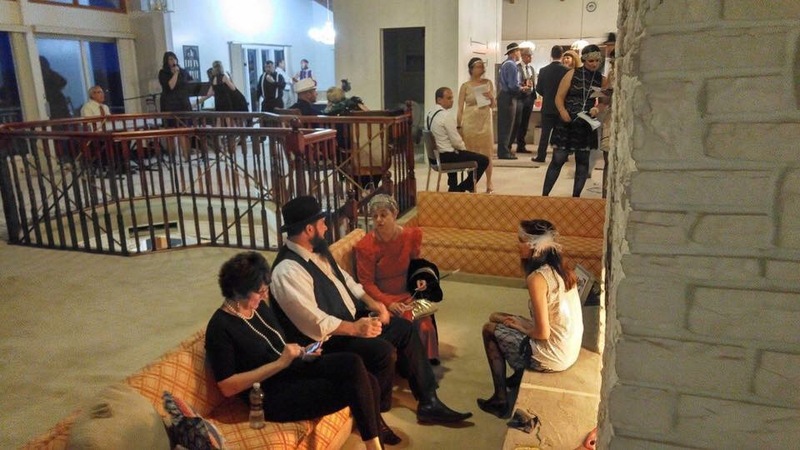 The preconception that murder mystery is strictly dinner theater is so pervasive, that our spin on it surprised people. Also, by getting them to see this interactive theater in a new way, we open their minds to new enjoyment and experience. Perchance they will be inspired, or at least tell their friends. Creating community is integral part of this show. From the outset the audience is told they are all here to solve a murder. That bit of information makes them a unique group, suddenly they all have something in common. Some chose to work together, to team up on the actors, others went solo, but, to my recollection, no audience members worked against each other. There were many times when I heard people discussing their guesses with others, using their own powers of deduction to arrive at their best guess. People shared information willingly. Freely. It was amazing. Some friendships may have be newly formed there, others were strengthened simply because of a positive, collaborative experience. In the bigger picture, a group of strangers came together, worked together for an evening, and no one was unhappy. To me, that counts for something. A new community: the Ruby’s cast with the audience after the show. Finally, improving quality of life. This is such a subjective idea. And, really, how can we really pinpoint how quality of life is improved? It’s difficult to quantify. But that’s ok. As a theater group, have honor to bring people joy, to lift them out of their ordinary lives, if even for a moment, to let them forget their troubles for a while, to provide a temporary reprieve from burdens, to expand their imaginations, and, hopefully, reach and change them emotionally. That’s a lofty, and worthy, goal, and Ruby’s touches upon some of those things (though being changed emotionally is a stretch). The more pragmatic reason is that simply by providing entertainment we make our community more attractive. We offer something to do. We offer the possibility of new interests. Maybe even hope. And that counts for something.